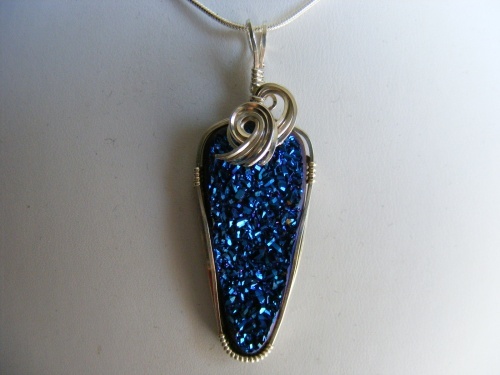 This unbelievable gorgeous midnight blue titanium druzy is mesmorizing to look at. Guaranteed to make your eyes, and everyone elses pop looked at. Gemstone is enhanced with beautiful sterling silver sculpting but not too much so not to hide the stone. One of a kind and so unique, this piece measures 2" long and 3/4" wide and comes with an 18" sterling silver chain.